Reports developed in the report designer need to be published to the report server in order to make them available to the end users. Once the reports have been deployed on the report server they can be managed through the report manager web application but that is more relevant to a site administrator as opposed to regular business users. 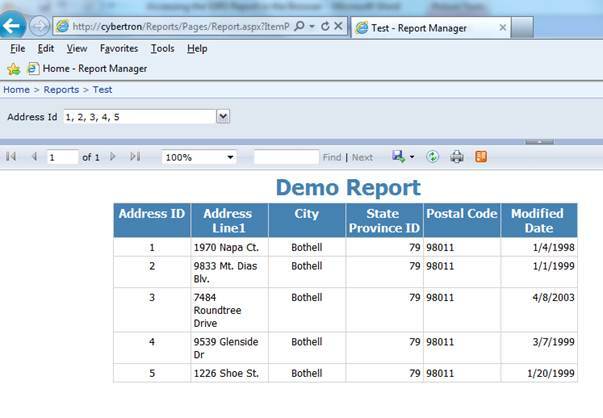 The best way to provide access to reports deployed on the report server is through the report viewer component which comes bundled with the .NET framework. This article give an overview on how you can use the report viewer component to access the reports deployed on the report server. 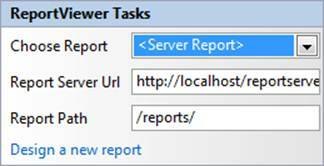 The report viewer component requires you to specify the report server address as well the report path, unfortunately setup is not as simple as one would imagine. Reporting services works strictly on the security model with the role based access security to provide access only to users who are authorized to view the report. 1. Open Visual Studio and select a new project as website and select ASP.Net as your project Template. Enter an appropriate name for the project and Click OK. The reason for specifying it in web.config is that you can easily change the report server name and the access credentials when deploying the web application in the production environment. In my case I have specified localhost as my server name, you can specify the machine name also if you wish but I would recommend localhost as best practice . The reportserver is the default instance, therefore if your instance is a named instance please specify the name as reportserver_instancename as the name of the reportserver. The username is the user who can access the report server and finally the password to connect to the reportserver. 3. Add the report viewer component to the basic.aspx page and specify the report server and the report folder in which you will be deploying the report. 4. You will need a credentials.cs file (attached with this article) to pass the report credentials to the report server. This because the user can be a part of the local machine or the domain, and the reportserver will need to validate that user before allowing access to the reports on the report server. The credentials.cs file will do the necessary. You can also define it in the aspx.cs file but I have defined it separately for better code separation. 5. I added the berlow code to it to initialize the report server with the credentials which have the appropriate rights on the report server to access the report. otherwise the web app will not recognise the reporting classes. The above code builds up the connection string with the values specified in the web.config to initialize the reportserver at run-time. 6. I have defined and deployed a test report on the reportserver which I will be accessing through the webpage using the reportviewer component. We can see the report datasources and reports folder deployed on the reportserver. The report test.rdl will be accessed in the front end using the webpage which we have just designed. 7. Build the web application and run it using the play button on the menu bar (or F5). 8. Once the application is running, a browser window opens with the deployed report. 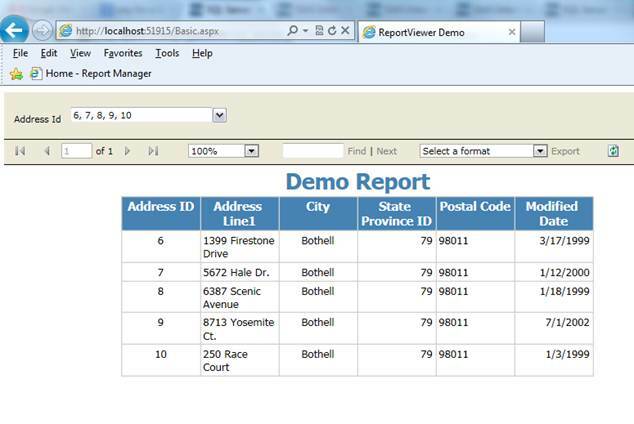 Thus we can easily access the SSRS reports from the front end using the report viewer with the user having appropriate permissions on the report server. In the next article we will see how to pass the parameters to the report from the webpage. The project can be downloaded here.